On a cool autumn afternoon, two families packed woven picnic baskets with freshly prepared dishes to enjoy on a secret beach. Their hampers were brimming with homemade hummus, warm thai larb gai (cooked with homegrown thai basil, mint, red chillies and limes from their vegetable gardens), sweet spiced maple kumara, juicy wedges of navel oranges, red wine, spring water, damper and raw vegetables to be cooked on an open beach campfire. 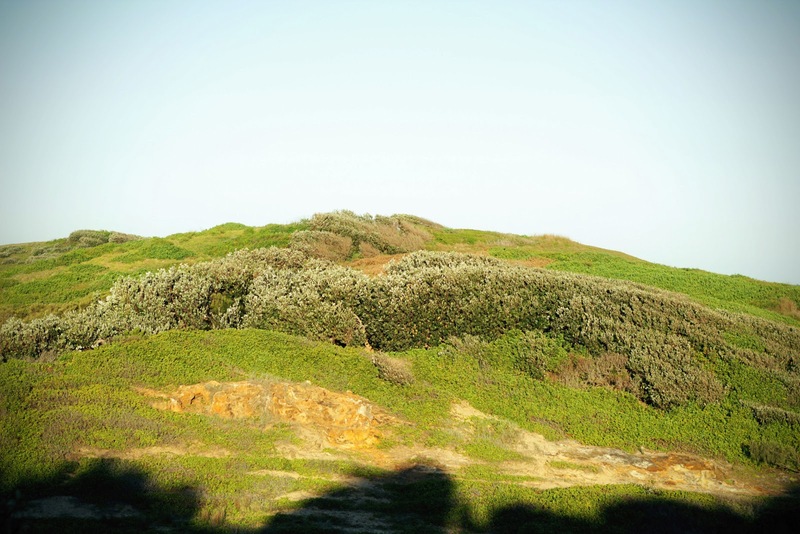 We walked over a grassy headland, kicking up sand with our thongs and basking in the last of the afternoon light as the sun cast long shadows over the land and coastline. 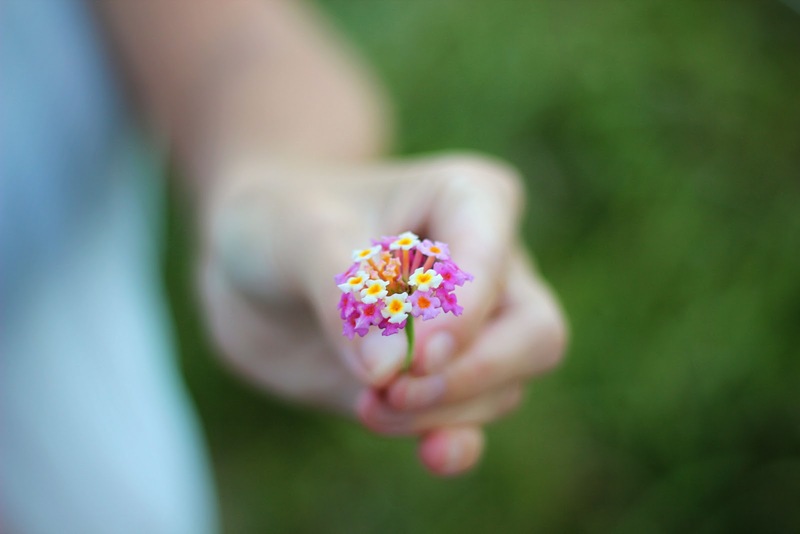 Along the way, my friend picked a tiny colourful flower and she surprised me by stating it was a weed. I find it intriguing that some weeds look so exotic and beautiful. We descended the steep sandy hill to our secret beach, where we unloaded our precious cargo and commenced scavenging the beach for dry pieces of driftwood to build our campfire. Our neighbour dug a shallow hole in the sand as we stocked the wood pile with ghostly white pieces of wood that had washed ashore during the recent storm. As soon as orange flames began to lick the sky and our blackened logs began to glow red, we pushed shiny, foil-wrapped vegetable parcels into the fire to cook as the children played with our excited puppy. Wine and water flowed as tiny waves crashed onto the shore. Sunset dimmed in the sky and soon the air was filled with the aromas that had followed us from our kitchen. One of our sides included steamed mushrooms with thyme, fresh from our garden. Peel or wipe the mushrooms with a damp towel. 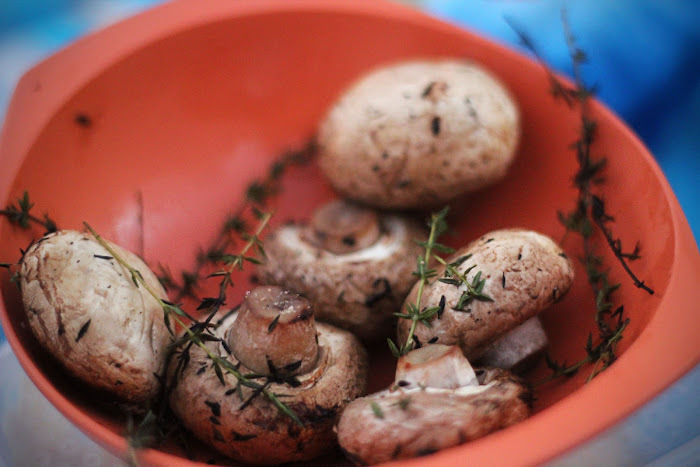 In a large bowl, coat the mushrooms with the finely chopped garlic, olive oil and toss with the thyme sprigs. Fold a long piece of aluminium foil in half and place the mushrooms on top. Season with sea salt and cracked pepper, then carefully seal your foil parcel by folding the edges together. The double layer is needed to prevent damage to the parcel and sand from mixing with your mushrooms. Cook the mushrooms on the side of your fire, away from direct flames for ten minutes. Carefully remove and open, taking care not to burn yourself on the steam. Serve in a small bowl. The number of potatoes you roast will depend on the number of people in your party. I tend to cook two for each person, plus an additional few in case you're hungry. Scrub and rinse your potatoes and allow to drain. 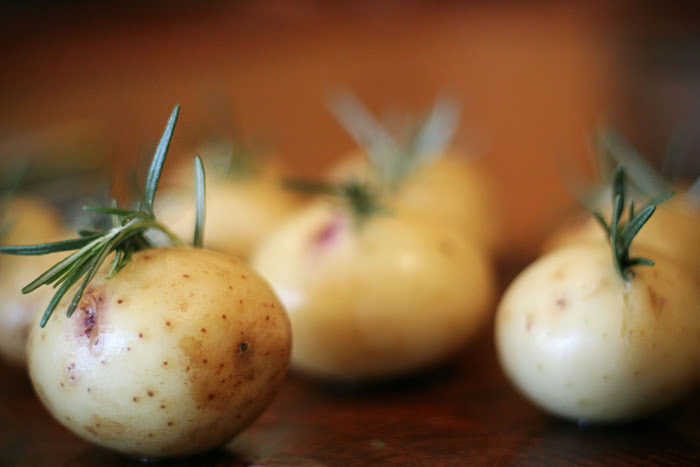 Prick each potato evenly with a fork about 20 times to allow for evening cooking, then slice a thin wedge in each potato to place a short segment of a fresh rosemary sprig. Spray each potato with olive oil, season with sea salt and cracked pepper, then wrap individually in aluminium foil. * If you prefer to slice your potatoes in half, you can smear a generous dollop of butter on each half, before sandwiching rosemary between the two halves, spraying with oil, seasoning and wrapping in foil. Once you have established your campfire, place the foil-wrapped taters into the coals and cook for 30 to 45 minutes. Remember to count how many you throw into the fire as the foil will blacken and make the potatoes difficult to see, especially after night falls. How to test if cooked: Carefully remove a potato from the fire and push a fork into the middle, if you can lift the fork back out without lifting the potato, your delicious campfire roasted potato is ready- Be careful not to burn your fingers! The soft flesh will be fragrant with the rosemary, with a hint of smokey flavour from the open campfire. 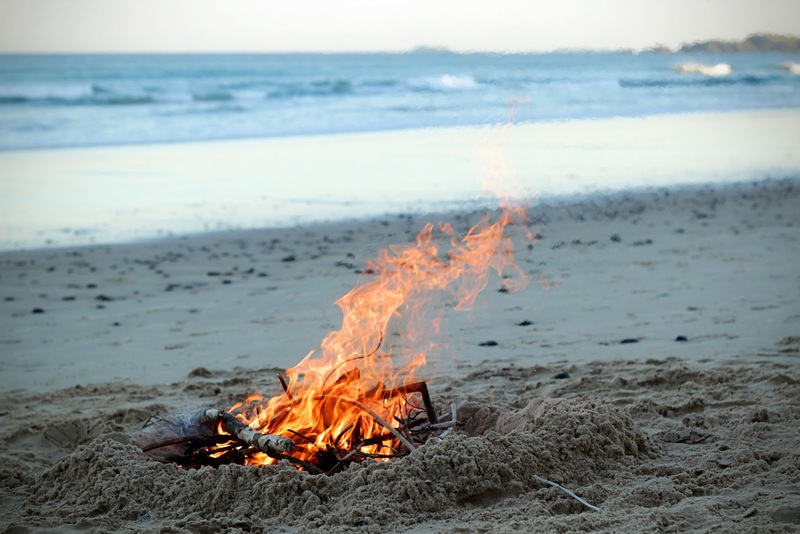 There's something magical about sharing campfire tales on a beach with friends. The children danced around the flickering light as yellow embers floated towards the sky, like tiny fire fairies. We gazed at the stars as the fire grew smaller, making out constellations and watching as the moon cast a silver lane of shimmering mirrors over the ocean. When our fire went out, we kicked sand over the glowing logs and made our way home to the hum of crickets and the sounds of the slowly churning sea. What beautiful beautiful photographs! Looks like a delight time!! 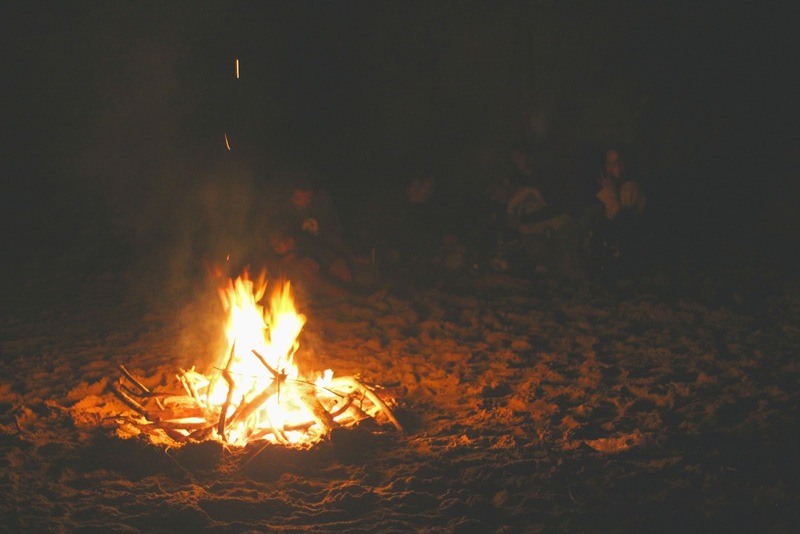 Thank you, I have many more pictures from our campfire but they contain images of our friends and in the interests of privacy, I've posted some less personal pictures. Thanks! It will be one of those nights that remain a highlight of my year and burned into my memory for many years to come. Perfect timing for the mushrooms & potatoes recipe's - I can't wait to try it all!